Indian Prime Minsiter’s world famous monogrammed pin- striped suit was liked by American President Obama as well. 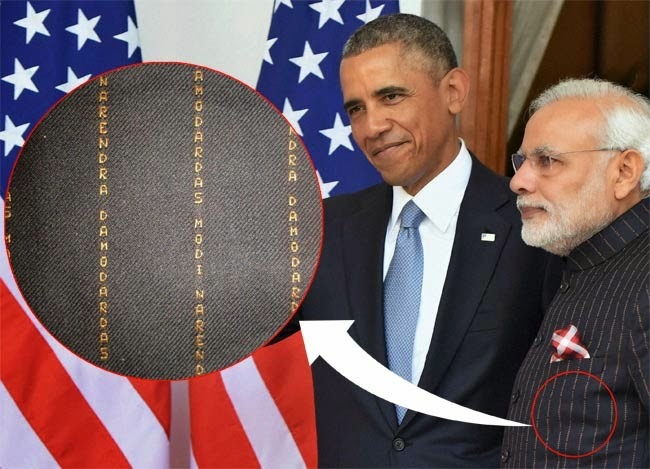 It is revealed that a Gujarati NRI businessman gifted the monogrammed pin-striped black suit that Narendra Modi wore during his famous 'Chai Pe Charcha' with US President Barack Obama last month in New Delhi. "I presented the suit to him (PM Modi) when I attended the recent Vibrant Gujarat summit," Ramesh Kumar Bhika bhai Virani said in an interview to ANI. "I gave it while extending an invitation to him to attend my son's wedding on January 26," he said. The controversial suit, which became the centre of a huge media attention after it was said to cost at least 1 million Indian rupees, is being auctioned along with 455 other gifts received by Modi at Surat to raise money for river Ganga. When asked to respond to political criticism of Modi and his suit, Ramesh kumar told ANI, "I am not a politician; I am a businessman. I am very far away from politics. For me, it is invaluable that Modi ji wore this suit on the day of my son's wedding." Reportedly Modi's colleagues in the Cabinet had also advised him to give the suit to an NGO for auction and use the money for the PM's pet Swachh Bharat Abhiyan. The money generated from the auction will be donated to a Varanasi NGO, sources said. PM Modi had flaunted the personalized suit with his full name 'Narendra Damodardas Modi' engraved on it in his Hyderabad House interaction with Obama on January 25. After that Modi was accused of strutting around in an expensive 'name suit', while his political rival Kejriwal is famous as middle class hero.